What is Insurance? definition, types and principles - Business Jargons. Definition: Insurance refers to a contractual arrangement in which one party, i.e. insurance company or the insurer, agrees to compensate the loss or damage sustained to another party, i.e. the insured, by paying a definite amount, in exchange for an adequate consideration called as premium. It is often represented by an insurance policy, wherein the insured gets financial protection from the insurer against losses due to the occurrence of any event which is not under the control of the insured. Life Insurance: The insurance that covers the risk of the life of the insured is called Life insurance. In this, the nominee will get the policy amount, upon the death of the insurer. This is also called as an Assurance, as the event, i.e. death of the insured is certain. The payment of the policy amount on the maturity will be made in one shot (lump sum) or periodical instalments, i.e. annuity. Whole life Assurance: Whole life assurance, is one in which the policy amount becomes due for payment on the death of the insured. Term Life Assurance: The insurance policy in which the amount has to be paid on the maturity of the specified term, for instance, 10 years or 15 years, then it is called as term insurance policy. Annuity: When the policy gets matured, the amount is paid in regular instalments, rather than in lump sum. Fire Insurance: A contractual arrangement in which the insurer promises to indemnify the loss caused to the goods and property of the insured due to fire, up to an agreed amount. Marine Insurance: When in an insurance contract, the insurer undertakes to compensate the ship or cargo owner against the risks associated with the marine adventure, it is called as marine insurance. It is further divided into cargo insurance, hull insurance and freight insurance. Miscellaneous Insurance: Apart from those discussed above, there are other types of general insurance business which cover different types of risks. It includes burglary insurance, credit insurance. Motor vehicle insurance, loss of profit insurance, fidelity insurance etc. 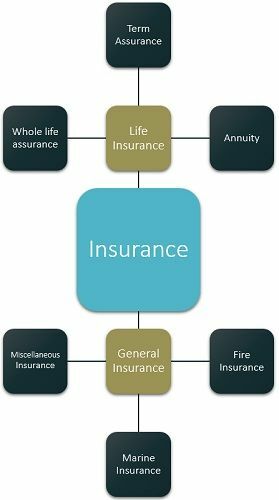 The life insurance and general insurance differ in the way that life insurance covers the life risk, whereas general insurance does not cover the risk of life. Secondly, the premium is paid at regular intervals in life insurance, but in general insurance, the premium is paid in lump sum for the year. Insurance is a great way to avoid the loss or shift it to another party. It also gives a sense of security to the individuals. Indeed, it mobilises savings of the individuals in the form of investment in the policies, which are reinvested by the insurance companies in the securities of the publicly listed companies, to earn a dividend on it.